We value our customers at The Interior Gallery and our commitment to deliver quality products to you is our priority. In order to provide our customers with the best value and fastest shipping results, we stock most of our items. Upon receipt of your payment, we will re-inspect your item, repackage it if needed to guarantee safe shipping, and ship it with in 1 to 3 business days (Rush Season and large orders may take longer). If we do not have the item available in stock, please allow 6-8 weeks for delivery. Some special order items might take longer. We encrypt your personal information, such as your credit card number, when transmitting over the Internet using SSL. When your browser is in secure mode, you will notice a blue bar at the top of the page and an unbroken key or lock at the bottom left corner of the page. TheInteriorGallery.com does not rent or sell information we get from Web orders or e-mail registrations to third parties. We strive to make the online ordering process as easy as possible. When shopping online, simply add an item to your Shopping Cart from any product page by selecting a size, a color, a quantity and clicking "Add Item." And, of course, you can always e-mail us your phone number, a convenient time to call, what the issue is and one of our representatives will get back with you if you have any questions. Please send emails to sales@theinteriorgallery.com. 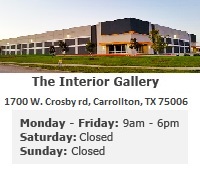 After you place an order by means of this site, you should receive an email acknowledgment within one business day to confirm that The Interior Gallery LLC (TheInteriorGallery.com) has accepted your order and is processing it. The email will contain the details of your order, the itemized and total amounts that will be billed to your credit card, including all applicable taxes and other charges. Please review this receipt carefully to confirm that we properly understood your order. The Interior Gallery ships all products in the most robust possible packaging, and selects the most appropriate shipping carrier based on the items ordered. However, sometimes breakage may occur due to carrier mishandling while in transit to you. Should this happen, we will require at least two clear pictures of any damages to be either mailed or e-mailed to our customer service team (info@InteriorGallery.com) as evidence for any claim we may make against the freight carrier, and as a requirement to receive credit or replacement merchandise. This claim must be filed within 2 calendar days of receipt of the merchandise. The Interior Gallery reserves the right to replace damaged merchandise within 30 calendar days of notification by the customer. If a replacement item is available for shipping within that time period then a refund cannot be issued. If no replacement is available, the damaged item(s) will be refunded in full. Any external evidence of loss or damage that occurred during transit is considered visible loss or damage and must be noted on the delivery receipt. Failure to adequately describe the visible loss or damage will result in the carrier refusing to honor the freight claim therefore waiving your right for any compensation by the freight company and The Interior Gallery. If the shipment is damaged and unusable, it may be necessary to refuse part or all of the order. Call our shipping department at (214)-614-8176 before refusing any shipment. The Interior Gallery will assist in filing a freight claim for damaged freight if the carrier is our normal in-house carrier. If the carrier was chosen by the consignee then it will be the responsibility of the consignee to file such a claim. Should a shipment arrive with damages caused by the carrier, the carrier will return the merchandise "Dead Head" at no cost to either party. Do not attempt to return any shipment back to The Interior Gallery without prior authorization from The Interior Gallery. Please review the The Interior Gallery Return Policy for additional information. Please note that any additional freight carrier's fees such as re-delivery, special notification, storage due to lack of response to appointment requests and lift-gate services are the responsibility of the customer (unless otherwise noted on your order). The Interior Gallery is only responsible for curbside delivery. The Interior Gallery will pay the basic delivery charges to the curb only. If other services, such as in-home delivery services are requested by the customer and billed to The Interior Gallery, all such fees shall then be re-billed to your credit card. If the freight carrier is unable to deliver the freight due to problems with contacting you or setting up delivery appointments, storage fees may be assessed by the carrier – in such case all storage fees are the responsibility of the customer and shall be billed to your credit card. 2. All returns require a Return Merchandise Authorization (RMA) from our Customer Service Department. Please e-mail us at info@TheInteriorGallery.com to obtain an RMA. No returns will be accepted or any credit granted without an RMA. To provide any credit or replacement units we must first have a chance to receive and completely inspect your return. 4. All claims for returns, damages or any other reason MUST BE MADE BY E-MAIL to info@TheInteriorGallery.com. The reason for the return must be clearly stated in the e-mail. Before taking any action you must have received a response from The Interior Gallery, with an RMA number. All shipments sent to The Interior Gallery without an RMA (Return Merchandise Authorization) number will be refused and the associated charges will be the sole responsibility of the sender. 8. Items being returned must ALWAYS be sent via ground transportation, insured by the sender. The sender is responsible for arranging the shipping carrier and pick-up for delivery back to The Interior Gallery, unless the return is due to no fault of the sender (for example, damaged merchandise or wrong item received). Shipping charges for items that are sent back by any means other than ground transportation (cheapest available) will be the responsibility of the sender minus the cost of the ground freight charge. This includes when the item is being returned at our expense – it must be sent cheapest method possible.